When I am working, I listen to XM Radio. I love their '60's on 6 channel, and it is frequently on here. 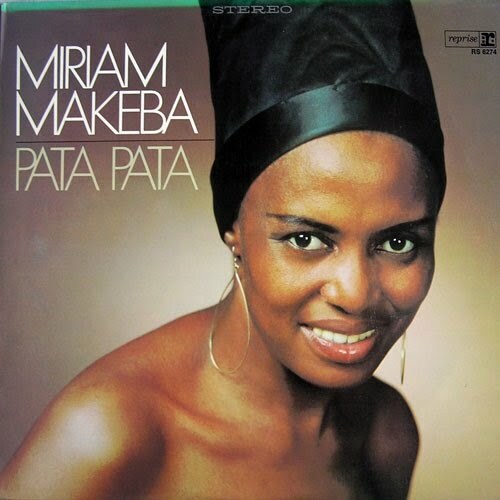 "Pata Pata" by Miriam Makeba is a song that I always turn up. I knew very little about the song or artist, and wanted to learn more. Miriam Makeba (1932 - 2008) was a South African singer and civil rights activist. She is the musical artist who first popularized African music worldwide. "Pata Pata" was released in 1967. The title means "touch touch." It charted at number 12 on the Billboard Hot 100 chart in 1967. Miriam Makeba had a full life, including winning the Dag Hammarskjold Peace Prize, performing at the 1974 Muhammad Ali - George Foreman "Rumble in the Jungle" fight, starring in the movie Sarafina!, and touring the world with Paul Simon for his Graceland album. Here is a wonderful video of Miriam Makeba performing on The Ed Sullvan Show in 1967. Enjoy! I loved watching this video of her perform! Right around 2:15 she starts to let loose a little more and she looks so happy. Plus her voice is just awesome. I love that you showcased here on your blog! I don't remember this song or the performer, but I love this music! I remember watching the Ed Sullivan Show after church every Sunday night without fail. Those were the days! Does anyone remember how he introduced Elvis to the nation--and the cameramen could only show him above the waist because of his too vulgar moves? Lol! It's so much fun to see what type of artists others listen to! Thanks for the insight! Thanks for sharing this post. My dad loved Miriam Makeba. We watched the Paul Simon Graceland tour hundreds of times growing up. I remember hearing this song.